This post is sponsored by Blue Circle Foods | Thanks for supporting the brands that I love + trust! What are you most looking forward to this holiday season? Entertaining and clinking glasses with your best pals? Or maybe kicking back in front of the fire place in plaid flannel pants covered in holiday cookie crumbs? The holiday season is a mixed bag for us this year—we get to indulge in a healthy balance of both. This will be our second Christmas staying put in Raleigh, but we need it. We spent the first six years of our life together traveling between Canada, PA, and NC for the holidays. So. We’ve earned it. We’ve learned to put guilty feelings aside and remind ourselves that it’s totally ok to take care of *us*. So much stress and pressure seems to come with the holidays and we’d like to make it… not about that. Blue Circle Foods’ Happy Fish. I feel like I haven’t touched salmon in ages! Which has me extra excited to partner up with Blue Circle Foods to bring you these tender, crisp, saucy, sweet, and savory sliders. These beauties couldn’t be easier to prepare thanks to Blue Circle Foods’ new product, Happy Fish. Four minutes poached, grilled, or sautéed, and you’re good to go. Happy Fish, which can be purchased at Whole Foods, is made up of sustainably-raised salmon and is shaped into adorable fish-shaped nuggets—which makes them appealing to kiddos! (Bye, chicken nuggets.) The only ingredients in these gems are protein-packed salmon, sea salt, and white pepper; no preservatives, no nasty breading, and no weird fillers. If you’re skeptical about frozen seafood, don’t be. There are good kinds and not-so-good kinds, just like with everything else. Happy Fish falls into the former group (and this is coming from someone who makes her own fish sticks). Happy Fish can be enjoyed on their own, thrown into pastas, tossed into stir frys, or sandwiched between itty bitty slider buns for a fun party favor with a healthy spin. 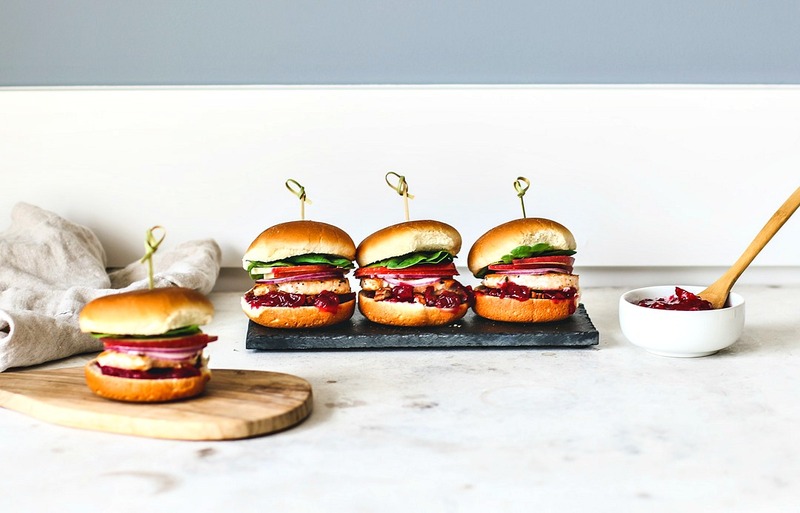 Sweet and Savory Salmon Sliders With Cranberry Sauce. In my experience, salmon truly is the most versatile type of fish. It pairs with the sweet, the tart, and the savory; you can serve it over salad, stuff it into a taco, or enjoy it between bread. Even when it comes to cooking methods, you can smoke it, fry it, grill it, and poach it. Initially, when I thought “salmon sliders”, my mind went straight to some kind of teriyaki and pineapple medley. But I wanted to keep things seasonal! So I went with cranberry sauce, toasted pecans, and crisp apples. And I’m so glad I did. This is a great way to use up any leftover cranberry sauce you might have kicking around over the holidays, but it’s also worth making a fresh batch if needed. I’ve provided my go-to recipe in the recipe card below. *Add an extra 15 minutes of cook time if you're making your cranberry sauce from scratch, and make it in advance since you need to let it cool. **To toast the pecans, place chopped pecans in a dry pan and heat them over medium-low heat for about five minutes, or until the nuts are fragrant and slightly browned. Keep a close eye on them so they don't burn. You definitely deserve to just do some relaxing this year! We stayed home too, and it was AWESOME. I'm totally loving these adorable fish shaped patties. And those apple slices! YUM! How adorable!! I didn't know that they even made anything that cute. We have a Whole Foods near us and I'm definitely going to see about the salmon. I think adults would get just as much of a kick out of the shape as kids. Your flavor combination of savory and sweet is very appealing. I can picture serving these sliders during several upcoming events. These are so adorable and healthy! My kids are grown, but they would adore these fish sliders. The cranberry, rosemary, apple, and red onion sound very well thought out. These would make a great weeknight meal served with some fresh sweet potato baked fries. Yummy! I've never been brave enough to make salmon sliders because I'm always afraid that it will slide off the bun. The flavors in this recipe however were just too good to not try. I don't know which of the ingredients accents the salmon the best, but I wouldn't change a thing. Hooray for staying home for the holiday! As wonderful as it is to see family, travelling this time of the year is so much harder / stressful than the rest of the year. Good for you guys! LOVE the idea of cranberry sauce with salmon - pinning this! Is it selfish of me to say that if I had moved, I probably would not be traveling home for the holidays? I always feel so stressed out during the holidays and the idea of having to pack up and fly back to visit just adds more stress! Last year we went to 5+ xmas dinners/celebrations and I was exhausted by the time 2019 rolled around! I'm definitely on your side about staying put this holiday! Anyways, back to your recipe!!! The little cut out of the fish is absolutely adorable! I love a sweet and savoury combo so I am here for this recipe. I need to find these little fishes ASAP! These look amazing. LOVE the group of condiments you chose. BUT....how come I never knew about these salmon burgers? Love the clean ingredient list and how simple they are to prepare. What a great trick up the sleeve when you have these in the freezer. I love this idea for an elegant but fun holiday starter or appetizer! The flavor combination sounds delicious, and a I love that the salmon fillets have no preservatives added to them. Great recipe! Oh, wow! These look so tantalizing! Sliders are so much fun salmon definitely kicks them a few notches. The fish-shaped parties are so dang adorable. The adults will love these and so will the kids! Love everything about this recipe. Will be making for a gathering a friends this New Year's! Thanks for the great recipe! Oh my gosh the shape of this salmon really makes me smile! I will keep my eye out for this brand on my next shopping trip. Maybe this is just the thing I need to get my son into seafood. I'm pretty sure I've never said this before, but "those salmon patties are adorable!" I love your seasonal twist to the sliders too. My nephews love salmon, but I really think they'd get a kick out of these sandwiches with those little fish-shaped patties. With a house full of people coming this weekend, I'm looking for delicious, easy-to-make dinners -- this one is all of that with a bit of pizzazz! OMG that salmon is the CUTEST ever!! I can't get over it. I LOVE salmon and am always looking for new recipes, so I'm excited about this one. Last year, I made salmon tacos with cranberry sauce and loved the combo, so I know I'd love this, too! OMG those look like little goldfish crackers on a bun. How cute is that?? I would have no problem eating a few of these for dinner. My grandkids would love these too. That flavour profile is very interesting...and I bet it tastes delicious too. I need to give this a try over the holidays.